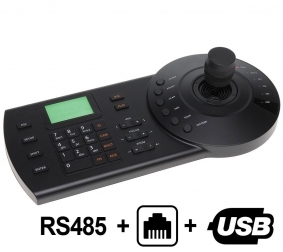 This Joystick Controller allow for easy control of our Network based PTZ cameras and HDCVI cameras. You can set up this joystick on the network and connect it to your Avalonix DVR or NVR to easily control any connected PTZ cameras. You can also use it in standalone mode to connect to cameras directly using either network base communication, or via RS485. It also offers USB connectivity to connect to a Windows Computer for easy control using SmartPSS.